So, all that beer talk gave me quite the thirst. And boy did I go to town satisfying it last night. It was a friend’s birthday, and he is probably the most beer-geeky of my friends. He appreciates a good drink, and I appreciate that. The night was going swimmingly enough, but we were ending up in the kind of trendy bars where you might get a fancy lager, but you’re unlikely to come across anything more interesting.Then, in the trendiest of them all, I spotted bottles of Brewdog’s Paradox Smokehead in the refrigerator. I ordered one for me, one for my pal. I can confirm this morning that it is not a good idea to have one of these when you’ve already had a few drinks. At 10% ABV, I must admit I was struggling this morning. So, how was it? First off, some disclaimers. This was a trendy bar, so no glasses were offered, and I felt self-conscious enough as it was, without asking for some. I did regret this. Also, they were chilled. The label suggested it be drunk at room temperature. Never mind. Well, this is a beer to bring out strong feelings. Everyone who tasted it had an opinion. Generally this opinion was, “It tastes like I’m drinking out of an ashtray”. And yes, it is smoky. Incredibly so. It is a joint venture with an Islay whisky company, and you certainly can tell. It tasted just like an Islay whisky, smoky and peaty and perfect for enjoying slowly in front of a roaring fire. So, perhaps not the ideal drink for a warm August evening in a loud trendy bar. It was like whisky in beer form, just without the burn you’ll often get with spirits. It was a bold, bold beer, and while I could taste the strength, it didn’t stop it being very drinkable, although I could understand other drinkers finding it a little challenging. But…this was very much an ‘experience’ beer. I would have enjoyed it more having it at home, without any prior, or subsequent, drinking. Perhaps with a good cheese, some good music, and that roaring fireplace. And certainly without the stinking headache I have today. That’s a pretty fantastic description of the beer. 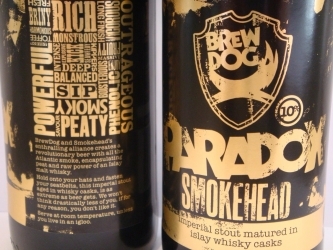 I haven’t had that BrewDog, but it sounds really good. A few lessons could be gleaned from your tale (neither will surprise you). First, I’m sure you’ve seen the value in sipping from a glass over just the bottle. Since smell is a large part of taste, the bottle limits that sense. Imagine smelling flowers through a straw. The flavors of this particular beer would have really opened up had the bar poured the beer in a snifter. Second, let the beer warm before trying. I’ve actually held a beer with both hands for several minutes before drinking just to get it to the proper temperature. Not only does it bring the beer to the proper temperature, but it buys you some time. Third, as I’m sure you’ve figured out, drink a lot of water with a 10% beer. A good rule of thumb when you’re drinking high-gravity beers is to drink the same amount of water in between each beer. Good to see you trying these beers out. That’s the only way to learn! Thanks for the comment, and apologies for the super-late reply. Holiday time ended up overruling blogtime. I’m coming to the conclusion that craft beer, especially the stronger stuff, is best enjoyed at home. That way I can control circumstances for optimum enjoyment, and minimise suffering the next day.